USC coach Kevin O’Neill is very adamant that the Trojans’ identity is its defense, and that it needs to stop its opponents in order to have a chance to win. The Trojans (13-11, 5-6) deviated from their defensive-minded strategy in their first game against Oregon State, allowing the Beavers (9-14, 4-8) to score 80 points in a loss in January. “That was a stretch of the season where we relied too much on help [defense], and on [junior forward Nikola Vucevic] to change shots,” said junior guard Jio Fontan. Trojan played hard against the Beavers and it paid off. On Thursday, the Trojans displayed a renewed defensive toughness, defeating the Beavers 67-56 at the Galen Center. It was the first win in four attempts for O’Neill against Oregon State. After trailing 11-6, the Trojans held the Beavers scoreless for more than seven minutes, going on a 12-0 run behind four points from senior forward Alex Stepheson. USC later went on a 9-0 run to extend their lead, and went into halftime leading 37-23. Oregon State cut USC’s lead to as little as five points in the second half, but the Trojans kept their defensive intensity, limiting the Beavers to 56 points, which was only one more than their season low. “We played more aggressively and smarter on defense,” Vucevic said. The Beavers are also renowned for their defense. They employ a 1-3-1 zone defense that is notorious for causing opposing teams to commit many turnovers. Oregon State came into the game leading the nation in steals, averaging 10.14 per game, and having committed less turnovers than their opponents in 14 of 22 games. The 1-3-1 zone defense did little to frustrate the Trojans though. The Beavers had nine steals, compared to five for USC, but the Trojans did a better job capitalizing on Oregon State’s mistakes, converting 28 points off turnovers, which was 18 more than the Beavers scored. The Trojans had 14 turnovers, compared to 19 for Oregon State. 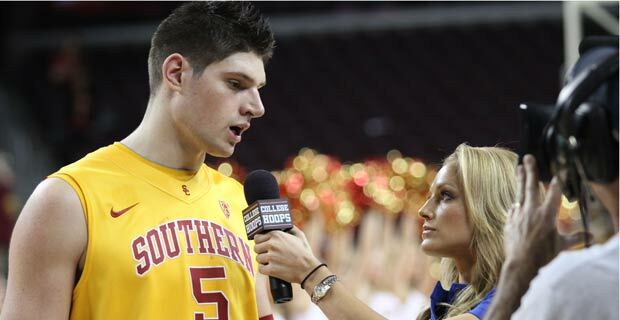 The Trojans were led by Vucevic, who had 17 points and 10 rebounds. Stepheson had nine points and nine rebounds, and senior guard Donte Smith contributed 13 points off the bench. Freshman guard Maurice Jones fouled out with eight points and a game-high six assists. Oregon State had a balanced attack, with 10 players scoring at least two points, and no Beaver scoring more than 11 points. The Trojans next host Oregon on Saturday at 7:30 p.m.
Coming into their Los Angeles road trip, the Ducks have won four of their last five Pac-10 Conference games, including their last two. Ducks’ senior forward Joevan Catron is the reigning Pac-10 Men’s Basketball Player of the Week after helping the Ducks sweep Washington State and then-No. 20 Washington last weekend. In those two games, Catron averaged 18.5 points, 9.0 rebounds, and 2.5 assists. USC fell at Oregon on Jan. 13, 68-62. In that game, which was the opening night of Matthew Knight Arena, the Ducks led by as many as 20 points in the second half. Catron did not play because of an injury in the first match-up between the two teams.